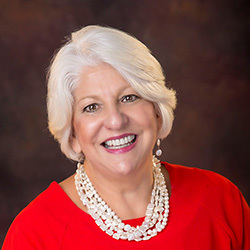 McALLEN — District 6 City Commissioner Veronica Whitacre will seek a second 4-year term, she announced late Sunday, with local elections approaching in May. Whitacre was the first person to publicly announce a candidacy this election cycle. No one else has announced a run for District 6, which encompasses southeast McAllen. Whitacre said she plans to file formally on Wednesday, the first day for candidates to submit formal documentation seeking office in May’s election. “I want to continue fiscal responsibility, ensure transparency and to support my constituents by representing them and being their voice when needed,” Whitacre, who was elected in 2015, wrote in a Facebook post announcing her candidacy. Whitacre also wants to improve infrastructure and help grow the increasing sales tax revenues in the city, she added in an interview after Monday’s city commission meeting. District 4 Commissioner Aida Ramirez and District 5 Commissioner John Ingram are also up for re-election in May. Ramirez has not indicated whether or not she will run. Ingram said after Monday night’s city commission meeting that he is running to keep his seat and plans to submit the formal documentation on Wednesday. Feb. 15 is the last day for candidates to file for the May 4 election. In Whitacre’s first election in 2015, she defeated former Police Sgt. Eduardo De La Rosa. Whitacre received 989 votes compared to De La Rosa’s 589 votes. She replaced former commissioner Jim Darling, who is now mayor. Whitacre placed an emphasis during her first term on health and wellness initiatives, including work on the McAllen Marathon and the McAllen Kids Marathon. Whitacre also helped launch the Run, Ride and Share program, which seeks to educate the community about safety issues for motorists, runners and cyclists. Whitacre has made health and wellness a key platform during her time in office and said she will continue to make those issues a priority. Her first term also featured frequent fights with fellow Commissioner Ingram, most often about her former job as the director of the nonprofit Comfort House — the short-term, temporary care center for terminally ill people. The city has historically given substantial assistance to local nonprofits, and Comfort House was one of them. City commissioners argued for years about the possible conflicts of interest at play, with Whitacre simultaneously serving as director of a nonprofit and as a city commissioner responsible for voting on funds for the nonprofit. Whitacre recused herself from voting, but Ingram and other commissioners were not swayed. The U.S. Housing and Urban Development had for years granted money to Comfort House, but after Whitacre took over the nonprofit, HUD ceased funding, citing conflicts of interest. Whitacre resigned her post as Comfort House director in August 2017. She is currently executive director for the Edinburg nonprofit Court Appointed Special Advocates For Children (CASA), which seeks to provide safe, permanent and nurturing homes for children.